Presented by Chevrolet. Discover the future of automotive technology in this ride that has you design and test your own futuristic simulation (SIM) vehicle. Step into the design center, where you will have the opportunity to design your own car, from the ground up. Choose a body style, add tires, engines, and accessories. Go practical, compact, and fuel efficient, or build a monster truck with twin turbo engines. The sky is the limit as you create your SIM car. Once your sim car has been saved (either to your Magic Band or a special card), you will board your ride vehicle, scanning your band along the way to load your design. You will compete in a virtual contest with the other occupants in your vehicle, as all the designs will be put to the test. Buckle up and hold on, because your car will be put through its paces, as different systems are engaged and tested. Feel the rush, as the finale features an outdoor lap around the building, with a 45 degree banked turn and speeds up to 65 mph!Test Track is the longest and fastest ride in the "World." 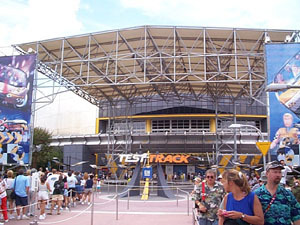 Test Track was reimagined in 2012 with a more futuristic "Tron" like look. The preshow area and most of the ride scenery was gutted. However, the track remains the same. The ride exit features several current and future concept cars presented by Chevrolet. A fun few activities are here as well for more fun with your SIM car after the ride. Guests must be 40" or taller to ride. Full ride point of view video including new standby queue and car design lab of the new Test Track 2.0 (daytime edit) - the reimagined version of the popular attaction at Walt Disney World Resort's Epcot theme park.